Number of players: The rules of spades require four people playing in partnerships opposite each other. You'll end up with two teams of two. 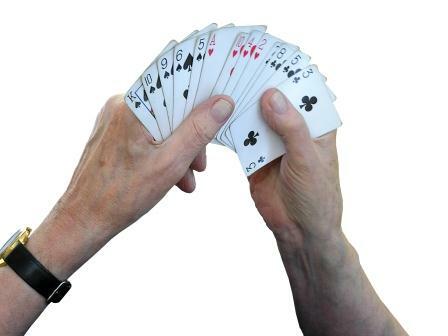 Average playing time: Each hand will take between five and ten minutes, depending on the bidding. A game can take up to an hour depending on the aggressiveness of the players and the speed of play. Fans of bidding card games such as Bridge or Rook will see similarities in the rules for spades as the opening part of the game requires players to take guesses about how many tricks (or books) they’ll be able to take. People who play Whist or Hearts will enjoy spades games, as the actual play is identical to these games. While the rules of spades for playing are very simple, the scoring can become quite tricky. The rules for spades call for four players playing in pairs and the partners sit across from each other. The whole deck of 52 playing cards is dealt out. At the end of the dealing, each player should have 13 cards. Each new hand has a new dealer and if the dealer makes a mistake and misdeals, there is often a penalty of 50 points invoked. The first part of the game is the bidding phase. Each player declares how many tricks they think they are likely to win. For example, if a player has two aces, they may say that they bid two tricks. Both team-members add their bids together and that becomes the team's bid. Keep in mind that the bids don't have to equal 13. Sometimes one team will bid seven tricks, and the other team will also bid seven tricks. That equals 14 which means that one team will not reach their bid. That's just the way the game goes and adds to the excitement. The rules of spades govern the bidding, which is the essence for scoring in the game. If the partnership manages to make the number of tricks they bid, they score 10 points for each successful trick. If the team doesn't reach their bid, then they lose that number of points times ten. So in other words, if they bid seven tricks but only reached six, they would lose 70 points. This makes it extremely important to bid realistically. According to the rules of spades, each team also score one point for any tricks that they made over their bid. These are called bags or sandbags. For example, a pair bidding six tricks and who actually wins eight would score 62. However, for every 10 bags a team scores in the game, they lose 100 points. This stops players under bidding and can dramatically change a game. A player can also earn a 100 point bonus by bidding nil, meaning they will win no tricks at all. If this does not happen, their side loses 100 points. This bonus or subtraction is in addition to the score of the tricks made by their partner. Not winning any tricks is harder than it appears! You have to throw away a great many cards and strategy is definitely required. Once the bidding is done, the game proceeds as in a game of Hearts. The first player must play any card apart from a spade and all players must play the same suit, if they can. The highest card of that suit wins the trick. If one player doesn't have a card of that suit in their hand, they can discard any suit including a spade. If any player plays a spade, it acts as a trump and the highest spade wins if more than one spade is played. At the end of each hand, the points are tallied and added (or subtracted) from the team's total. The rules of spades suggest a limit of 500 points per game, but players may set their own limits depending on the time available. I usually played to 1,000. As with all Whist variations, Spades is a tricky balance between trying to win as many tricks as possible and trying to be cautious. You can only see a quarter of the cards, so other players have plenty of opportunity to keep their higher cards till the end and upset your plans. You need to be able to calculate fairly accurately the number of tricks you will make to avoid the 10-bag penalty. In most rules of Spades, the Jokers are utilized as the top cards. They beat any other card, even other spades. There is a variation that I play that really adds to the fun. It's up to you if you'd like to use this or not. How I play, is that the Jokers are identified as "Big" and "Little". If the Jokers look identical, then just write "Big" on one so you can tell the difference. Big Joker - This card can be played only when the spades have been opened (someone has already played a spade). If the Big Joker is played, then the other team MUST put down their highest spade card in their hands. This serves to rob the other team of their highest spade cards (and hopefully make them miss their bid). Little Joker - If this card is played, then the other team is forced to put down a spade card, but not their highest. The little joker still beats all other spades, but this serves to drain the opposing team of a spade. There are also a number of bidding variations that you can use in your game. These must be announced when you are making your initial bid for your team. Here are just a few that I usually play with. 10 for 2 - Your team needs to get 10 tricks, for which you'll receive 200 points. Little Mo' - Your team must get the first 6 tricks. You can lead off with the Big Joker if you bid Little Mo. If you manage successfully get the first six tricks, you get 250 points. If the other team manages to stop you from accomplishing this, your team loses 250 points. Big Mo - Your team must get the first 8 tricks. You can lead off with the Big Joker if you bid Big Mo. If your team is successful in getting the first 8 tricks, you are awarded 500 points. If not, you lose those 500 points. Boston - If your team bids Boston, you must get all 13 tricks. If successful, your team automatically wins. If not, your team loses. The rules of spades make the game play easy to learn, but younger children may struggle to get a good handle on the bidding system and its consequences. It can be a good game to play once a child has learned the structure of games like Hearts and Rook. For adults, an edge can be added in by playing for money, with a suggestion that the losing team pays the winning team a dollar for every 10 points by which they lose.